For general inquiry, please contact our General Affairs Section. 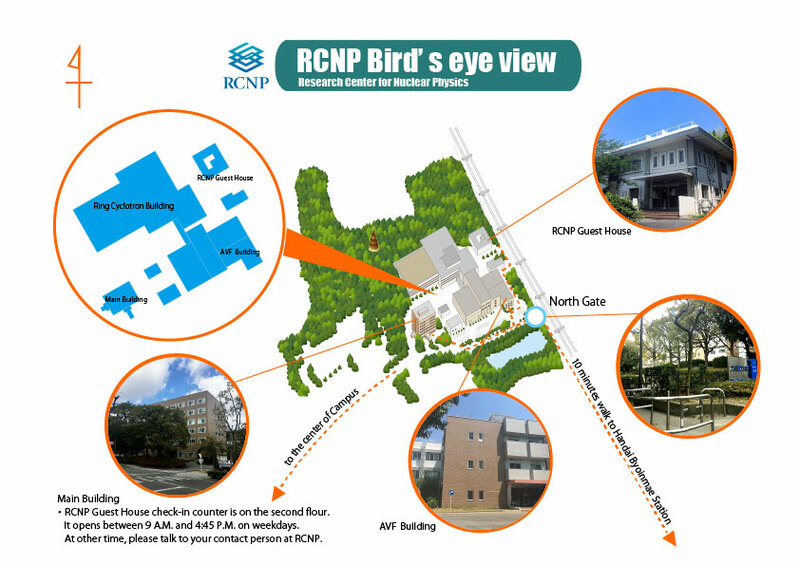 If you have any questions about the operation of this site please contact us at ml-www-admin@rcnp.osaka-u.ac.jp . 10 min walk to RCNP. Please follow the long, orange dashed line shown in the figure above. Please do not enter the campus immediately from the station. Within 10 min, you will arrive at a small gate for pedestrians (North entrance). RCNP is just next to the north entrance. Please see the map below. Take the subway "Midosuji-line and Kita-Osaka Kyuko" going to Senri-Chuo. Get off at Senri-Chuo Station and take the Osaka Monorail going to Kadomashi. Change at the Bampaku-kinen-koen station and take another monorail bound for Saito-nishi. Get off at Handai-byoin-mae. The journey lasts 1 hour. Take the Osaka Monorail going to Kadomashi. Change at the Bampaku-kinen-koen station and take another monorail bound for Saito-nishi. Get off at Handai-byoin-mae. The journey lasts 30 minutes. 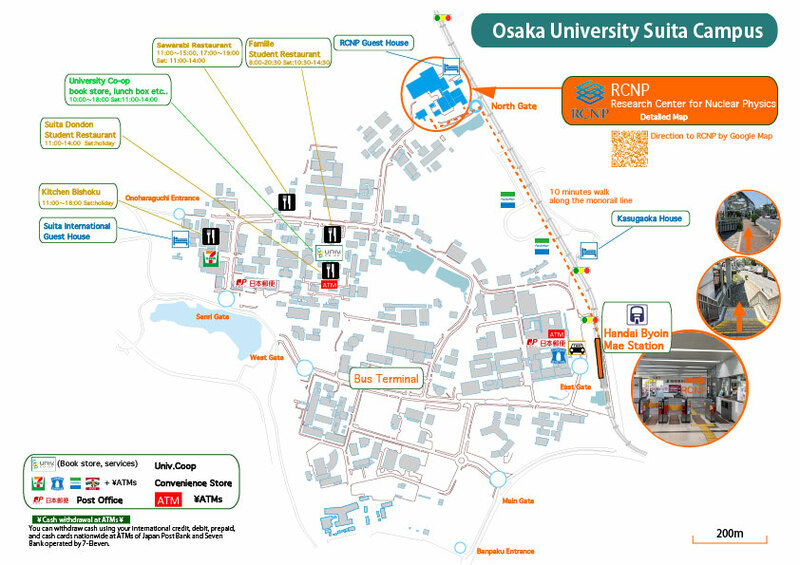 Take a limousine bus bound for Osaka Airport (also known as Itami airport) leaving from the No.8 bus stop of the terminal 1 or No. 2 bus stop of the terminal 2. Get off at Osaka Airport. The journey lasts about 1h30min. Ticket costs about 1950 yens. One should buy it at a vending machine near the bus stop. From Osaka Airport, take the Osaka Monorail going to Kadomashi. Change at Bampaku-kinen-koen station and take another monorail bound for Saito-nishi. Get off at Handai-byoin-mae. The journey lasts 30 minutes. Ticket costs about 400 yens.